Once an economy's budget for a biological flow has been scientifically or politically established, the budgeted amount must be allotted to the final outputs that require the flow in their life cycles. Each such allotment is called a budget share. The question is: how should these budget shares be determined? To frame this question using a simple example, consider the case where the budget is 100 units of a particular pollutant, and four outputs unavoidably expel this pollutant in their life cycles. What is a rational basis for establishing the budget shares for these four outputs? The most obvious choice is to divide the budget evenly by allotting 25 units of the pollutant to each. However, this makes little sense from the ENL perspective: one of the outputs may be able to achieve a great deal of health, while another may be able to achieve very little; some may even result in negative health. If our objective is to maximize a society's overall health, an environmental budget should not be divided evenly or arbitrarily, but strictly on the basis of an output's health-generating potential. For this reason, ENL’s method is to allot the next unit of a biological flow to the output that will achieve the greatest incremental health benefit. The size of this unit is a matter of convenience and will likely differ for each flow. To illustrate, we can continue with the above example. The four outputs are called A, B, C, and D, and the output quantity for each is currently zero. When the first unit of A is consumed, it is expected to achieve the highest marginal gains of the four outputs. The first unit of B is expected to achieve the second-highest marginal gains, etc. Clearly, the initial unit of the pollutant should be allotted to output A. In fact, the pollutant should continue to be allotted to A until its marginal gains have decreased to those of B. After this the pollutant should be allotted to A and B equally, up to the point where their marginal gains have decreased to those of C.
Then the pollutant should be allotted to A, B, and C equally, until their marginal gains have decreased to those of D.
Finally, the pollutant should be allotted equally to all four outputs until the budget of 100 pollutant units is fully exhausted. This method of equalizing marginal effects, which is well-known in standard economics, ensures that the greatest health gains will be squeezed from the waste in question. The method also applies to allocation in general: the next unit of an input should be allocated to the output that, at its current quantity, will achieve the greatest marginal gains. The method is general, powerful, and works whenever we must choose rationally among multiple alternatives. It should also be noted that the allotment of renewable resources is precisely the same as their allocation. Allocation means the assignment of inputs to the production of outputs, which means that the allotment method just described is congruent with their allocation method. ENL’s approach to environmental budgets and the allotment of budget shares is summarized in the following figure. An economy has a budget for every biological flow, based on physical realities as established by science and possibly through political agreements. Each budget is allotted to the final outputs that need the flow in proportion to the marginal health gains expected from these outputs. In this highly simplified picture, the economy requires three biological flows, and therefore has three environmental budgets. The budget for the second flow is divided into four budget shares, corresponding to the four outputs that require this flow. As explained above, the division of these shares is done on the basis of the relative health-generating capacities of the outputs at the margin. This allotment method results in the maximum amount of health that the economy can achieve from utilizing this flow at the budgeted rate. 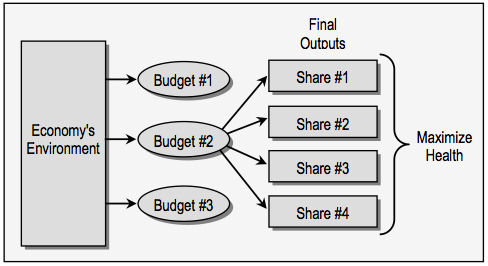 It should be emphasized that a budget share pertains to the final output's entire life cycle. The effectual value from the consumption of a final output is not achieved in isolation, but requires all stages before and after consumption. The flows required for all these economic activities must therefore be totaled in order to determine the final output's overall flow requirement. We now have to shift our attention from a specific flow to a specific output. Our initial task, after all, is to determine an output's ecological limit. The practical consequence of assigning a budget share to an output is that this indirectly sets the maximum quantity for its production. Once an output has exhausted its budget share by using its entire allotted flow, it has reached its share limit for this flow. To safeguard the environment, production must stop at this output quantity. However, this is obviously not the whole story. Each output will typically have not one but many biological flows associated with it. Imagine any output — a cup, a book, a set of skis — and consider the numerous natural impacts each has during its life cycle, from resource extraction to disposal. A typical output thus has multiple share limits associated with it. The next question to be answered is therefore: What is the relationship among these share limits in setting the ecological limit for an output's production?